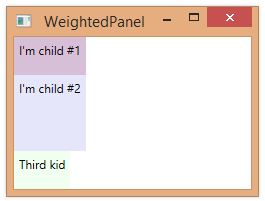 Here’s an example of a custom panel that uses an attached property (weight) in determining both size and position of child elements. Below, we use this panel, specifying that 2nd label is 2x bigger (more weight) than the first label. <Label Content="I'm child #1" loc:WeightedPanel.Weight="1"
<Label Content="I'm child #2" loc:WeightedPanel.Weight="2"